Stop the Presses! 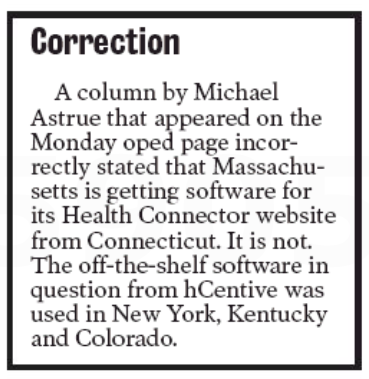 Boston Herald Runs Correction!! As most of you know, it’s a rare thing indeed to see a correction in the feisty local tabloid. Think of it as a sort of Halley’s Comment when one does turn up, as actually happened in today’s edition. As old friend Dan Kennedy noted at Media Nation, “the Washington Redskins trademark ruling will have little effect.” But that had no effect on the Herald. [U.S. Attorney Carmen Ortiz] should look at the grant HHS awarded to Massachusetts to “help” other New England states build their exchanges. As silly as it looks now, HHS believed that Massachusetts would excel among the states because it built the first exchange during the Romney administration. Ironically, Connecticut is now providing Massachusetts with indispensable software and technical assistance. Ortiz needs to find out how [Massachusetts Health Connector Executive Director Jean] Yang spent the HHS grant and whether she illegally redirected funds to pay for the state’s staggering cost overruns. 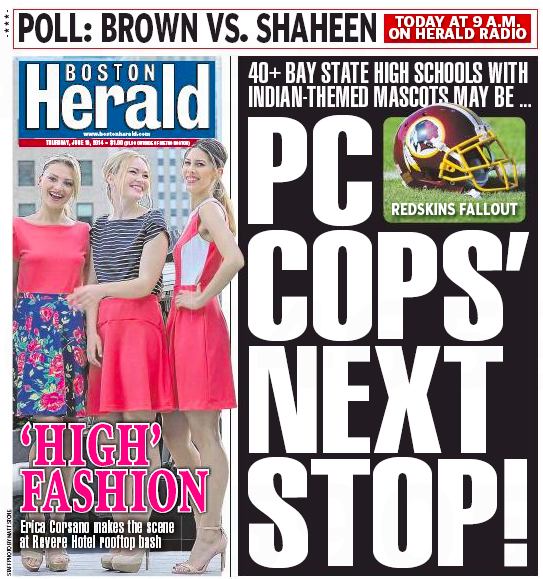 Maybe the Herald’s finally lost enough libel lawsuits to make it a little less, well, Heraldish. This entry was posted on Friday, June 20th, 2014 at 4:55 pm and is filed under Uncategorized. You can follow any responses to this entry through the RSS 2.0 feed. You can leave a response, or trackback from your own site.